HARARE – Horror stories are slowly emerging of how the country’s trigger-happy security forces brutalised ordinary Zimbabweans this week — shooting 68 people and leaving dozens others requiring life-saving surgeries nationally following deadly clashes between protesters and law enforcement agents over steep fuel price increases, the Daily News can report. This comes as civil society organisations (CSOs) have also sent distressed calls to the African Union (AU), calling for intervention in the country’s deepening crisis which has seen opposition officials and pro-democracy activists being targeted by the government in its fresh assault on dissenting voices. In a comprehensive report that lifts the lid on the violence which occurred around the country during this week’s stay-away called by the Zimbabwe Congress of Trade of Unions (ZCTU), the Zimbabwe Association of Doctors for Human Rights (ZADHR) revealed all the gory details of the brutality meted out to people by security forces. “The Zimbabwe Association of Doctors for Human Rights wishes to share with stakeholders critical information on the unfolding human rights crisis in Zimbabwe following the outbreak of violent protests across the country and the ensuing disproportionate response by the State apparatus. “To date ZADHR network of doctors across the country both in the public and private sector have attended to a total of 172 cases … 68 cases were gunshot wounds with the affected individuals sustaining severe injuries which required urgent surgery in most cases. “The remainder of the cases ranged from assaults with sharp objects, booted feet, batons, sjamboks and tarmac abrasions,” the organisation said. “ZADHR is also deeply worried by cases of dog bites following the alleged unleashing of police dogs on those in police custody in Kadoma. “Three such cases have been documented. This constitutes a serious violation of human rights as the State is supposed to guarantee the protection of those in police custody,” it added. “ZADHR also witnessed with shock and condemnation the dragging of patients with life-threatening conditions to court. “There are cases of patients who had chest trauma (haemopneumothorax) and fractured limbs (femur) who were forcibly taken from hospital to attend court despite the advice of doctors. “ZADHR has it on record that 17 individuals have to date undergone emergency surgery as they had life-threatening conditions. “More cases continue to be reported to the association as many people were barricaded from communication and accessing treatment facilities,” the doctors said further. This comes after thousands of fed-up citizens heeded calls by the ZCTU to stay away from work in response to President Emmerson Mnangagwa’s unpopular decision to sharply hike the prices of fuel — triggering riots in the process and the subsequent mayhem which was witnessed mainly in Harare and Bulawayo this week. 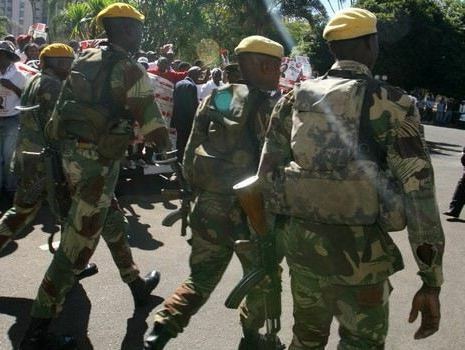 As a result, CSOs are now asking the AU to intervene in Zimbabwe’s worsening crisis. The petition — addressed to Rwanda president and AU chairperson Paul Kagame, and copied to all African heads of state — says the AU should step in to avert a catastrophic situation in Zimbabwe. “The Zimbabwe State’s response to the national stay-away has been disproportionate marked by a clampdown on fundamental rights and freedoms. It is our considered view that the country might be sliding into a state of emergency. “There are reports of arbitrary arrests, unlawful detentions and abductions of unarmed civilians and civil society leaders, including children below the age of 16 years. “Multiple threats and intimidation by government officials against trade unions, civil society leaders and ordinary Zimbabweans are continuing unabated. “More than 150 people arrested … have not been charged nor brought before a competent court of law. The right to freedom of movement has been restricted, affecting the ability of ordinary Zimbabweans to sustain their livelihoods. “This might result in regional instability as Zimbabweans seek food, shelter and refugee in neighbouring countries,” CiCZ said. Mutasa said his brother, who resurfaced only on Wednesday, was blindfolded and taken to an unknown location where he was viciously tortured — before his captors demanded to know Peter’s whereabouts. On Wednesday, Mutasa — who was said to have gone missing since Monday — presented himself to Harare Central Police Station in the company of his lawyer Alec Muchadehama. “Police said they had absolutely no interest in me. I then asked why they came to my home, and they denied ever doing so. “I then reported that I wanted the people who broke windows and illegally gained entry into my home, harassed my family and abducted my brother to be apprehended and charged. “Police said they would see what they can do. I now fear for my life because it seems there is an attempt to extra-judicially abduct me. My life is in danger,” the distraught Mutasa told the Daily News. Although the ZCTU had called for a three-day strike, this continued yesterday, with most companies — including banks and supermarkets in Harare remaining closed. For the fourth day running, schools also remained closed due to a combination of the worsening transport crisis and fears of pupils’ safety. The government has also appealed to commuter omnibus and other transport operators to resume their services as the situation had “normalised”. “We are … appealing to all public service providers to render their services to the people of Zimbabwe and in the same vein urge transport operators to resume carrying passengers, schools to open and generally for the public to engage in their various activities freely,” State Security minister Owen Ncube said in a statement.